Recently, the story of a 29-year old California woman named Brittany Maynard made headlines around the world. Newly married, Brittany was diagnosed with glioblastoma, a rare, aggressive and inoperable brain tumor, earlier this year. Initially hoping to die at home in hospice care, Brittany writes that such an option would bring about undue suffering and a “nightmare scenario” for her family. Since there is no cure for her illness, Brittany announced that she intends to end her own life on November 1, surrounded by her husband and family. Brittany, her husband and mother have relocated to Oregon because of the state’s “Death with Dignity” law, under which mentally-competent, terminally-ill patients with a prognosis of six months or less to live can request and receive a prescription for a lethal dose of medication to help them end their lives. In assenting to God’s timing for the length of our days, we recognize God as the author of our lives, the artist who creates and loves His masterpiece. Those of us who witness and accompany the suffering of the sick and dying participate in an important part of pro-life ministry. Such self-giving, sacrificial love can help caregivers answer Christ’s call to sanctification through action. 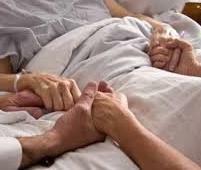 The dying process can be a gift by which we both give and receive love and grace, not only for the person who is dying but for their loved ones as well. During this Respect Life month, let us pray for the Maynard and Tippets families and for all those who are nearing the end of their earthly life, that we all may come to a deeper respect for each other as masterpieces of God’s creation.